The approach when given room to move is highly iterative at all phases but there is a danger in some circumstances of following the model too rigidly. In these projects designers can be perceived as dogmatic, inflexible, and even naive and idealistic. Worst still is when designers are labelled as “too theoretical” and “too academic” which can be a polite way of saying a team is not focused on the goals or has no commercial acumen. A model of design thinking – Hear Create Deliver – from Ideo. In digital design projects the place of Design Thinking versus Lean UX methods is easier to negotiate, plan, and see. There are often internal precedents and design patterns to follow, and data to inform the problem and the best approach and tools to solve that problem. It can be less obvious to plan the right approach and activities for product design, service design and customer experience initiatives. There are complex ecosystems and lifecycles to consider from both the organisations side and the customers’ side. In an effort to unpack this system the argument for Design Thinking is to go wide and exploratory with research and concepts with the promise of new insight and radical innovation. Teams that then present familiar research and ideas underwhelm their collaborators and clients, and can tarnish the reputation of Design Thinking in the process. A useful frame to consider when planning what approach to take and what tools to apply from Design Thinking is the Cynefin (pronounced kuh-nev-in) framework widely adopted in agile practices. It outlines systems as simple, complicated , chaotic, complex or disorderly and goes on to outline what response is best suited to solve for these contexts. Complex systems require a probe, sense, respond response best suited to emergent practices. This is the sweet spot for Design Thinking. 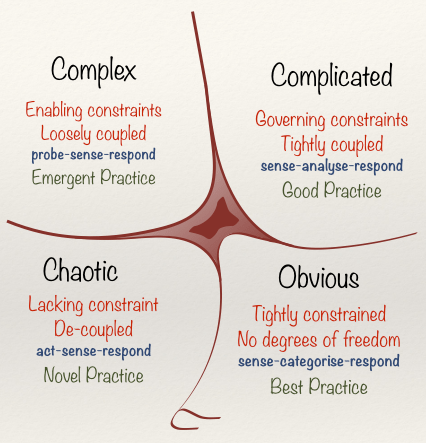 The Cynefin model. Illustration taken from the comprehensive Wikipedia entry. Design Thinking emphasises sense making and problem definition as core tenents. Taking a step back to consider or hypothesise the problem space with a framework like Cynefin, can help inform where and how to start looking at and solving a problem. This doesn’t mean abandoning Design Thinking. It does mean critically looking at a brief and considering where Design Thinking can demonstrate the full potential of its methods and ultimately deliver the most value. I will leave the full explanation of the Cynefin framework to the comprehensive Wikipedia page and to its author David Snowden. What's love got to do with MVPs? Thanks Anthony for taking the time to comment. And thanks for the interesting reading. The central point I was making was to take a step back to consider the right approach. I’ve seen designers flounder taking an experimental approach, and doing wide research when the problem space once identified warranted best or good practice. I appreciate that Cynefin is a sense making model – and that time and thought and data is needed to know how best to respond. My point was that we shouldn’t follow a particular approach like doctrine in all situations. Could you tell me more about what you mean by “obliquity’s role in problem discovery”?